An online repository of Indian liberal writings, indianliberals.in was launched in 2015. The intent of the Indian Liberals archive which presently hosts up to 50,000 digitized pages is to offer exhaustive and comprehensive resources on the liberal discourse in India by ensuring high diversity of content. Indian Liberals portal is a platform for consolidating and curating Indian liberal literature, to document, preserve and disseminate the robust strands on liberalist thinking that have marked Indian history. Eligibility: Open to youth throughout India. You must be at least 18 years and no older than 30 years of age. Language: Essays should be written in English. You are welcome to write in your native language, but it must be translated into English for submission. Fourth Industrial Revolution – What it means for India? – All the winners will receive a certificate of recognition from the Centre for Civil Society. – Essays must be no fewer than 700 and no more than 1500 words. Spelling errors will count against the final grades. – Name your submission file as “firstname_ilessay2019”. Mail your photograph and brief profile along with the submission. – Winning essays will be featured on our Indian Liberals website, alongside a brief profile and picture of the author. – All entries become the property of Centre for Civil Society and will not be returned. They may be reproduced on our website and/or shared with third parties for purposes of marketing. 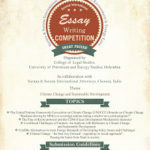 Second ‘Enervions’ International Essay Writing Competition by College of Legal Studies, UPES, Dehradun in collaboration with Surana and Surana International Attorneys, Chennai, India.